There are many times that we need to get work done quickly and efficiently. We often go into “tell-mode” when time is short or we are under pressure. Telling people what to do is ok when we want our own way, to our specific details. The problem is when we come across a situation or a person where it is they who have the power to decide when and how they do something we want done. It is in these situations when we realise the limits of our power and skills of communication. You could say that being persuasive is when someone does something well, that you want done, because they want to do it. Like any aggressive behaviour, manipulation is short term and people are not easily fooled more than once. Therefore, if we are in it for the long-term, then manipulation is not the way to go. Being aligned to our message is critical to delivering it with truthfulness and generating trust in your team. 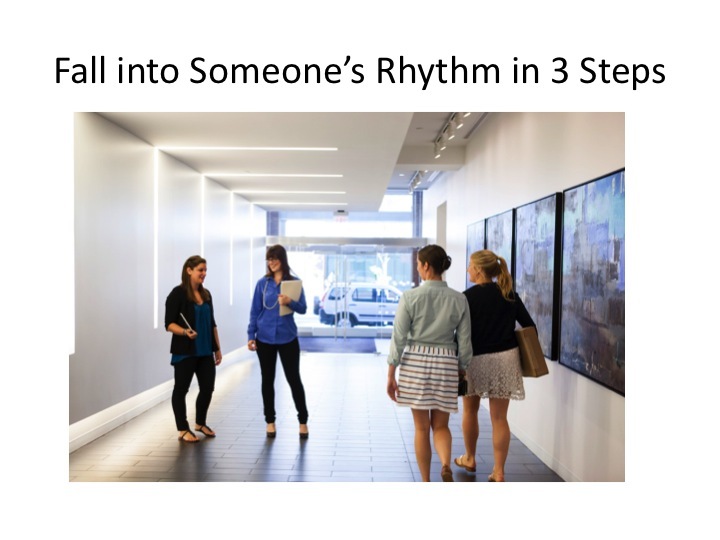 Being persuasive is similar to being in step with someone, or falling into someone’s rhythm, as our headline suggests. Here are some steps you can take to make it easier for you to communicate with people and increase collaboration. Pay close attention to the person’s speech. Have you ever watched two people where one is clearly talking 2-3 times faster than the other person? Both will increasingly become frustrated with each other because there will be a lack of understanding. Match how fast they are talking and note the pitch of their voice and if it’s lower than yours, take yours down a notch or two. Watch your space. Get too close too quickly and the other person will back off. Stay too distant and communication will also be distant. You’ll have to raise the volume of your voice to be heard. An example of good leadership is when a leader asks the team to huddle up and get closer in order to speak to all of them without raising their voice. Your body language is absolutely the key to gaining trust and rapport with your team. Specifically, you should be communicating commitment in your stance, if you are talking to your team about commitment. You will get more acceptance of your message if you align yourself inwardly to your words. You must believe in your message first, before you can persuade others. We call this congruency. Align yourself inside then you will show it outside. Being persuasive is a skill and needs practice, practice and more practice. The one thing you cannot practice is sincerity. That has to come from your heart. This entry was posted in Customer Service, emotional Intelligence, Leadership, Performance Management, Time Management and tagged Body language, Change Management, coaching, communication, confidence, conflict, decision-making, delegation, motivation, negotiation, productivity, relationships. Bookmark the permalink.